The Forbidden City was built in 1406-20 and served as the main imperial palace for the Ming and Qing dynasties for almost 500 years. The complex consists of around 980 buildings and is 961 metres from north to south and 753 metres from east to west. St Joseph Cathedral was built in 1913-16 in the French concession area, using brick imported from France. It was the tallest building in Tianjin for around 80 years. The three towers were destroyed during the Cultural Revolution but was rebuilt in the 1980s. It is also known as Lao Xilai Catholic Church. The Tianjin Tower, also known as Jin Tower or Tianjin World Financial Centre, is a 337-metre office skyscraper. It was built in 2007-11 to a design by Skidmore, Owings and Merrill. At the foot of the skyscraper can be seen a bridge across Haihe river. This was built in 2003-04 to a design by Deng Wenzhong. 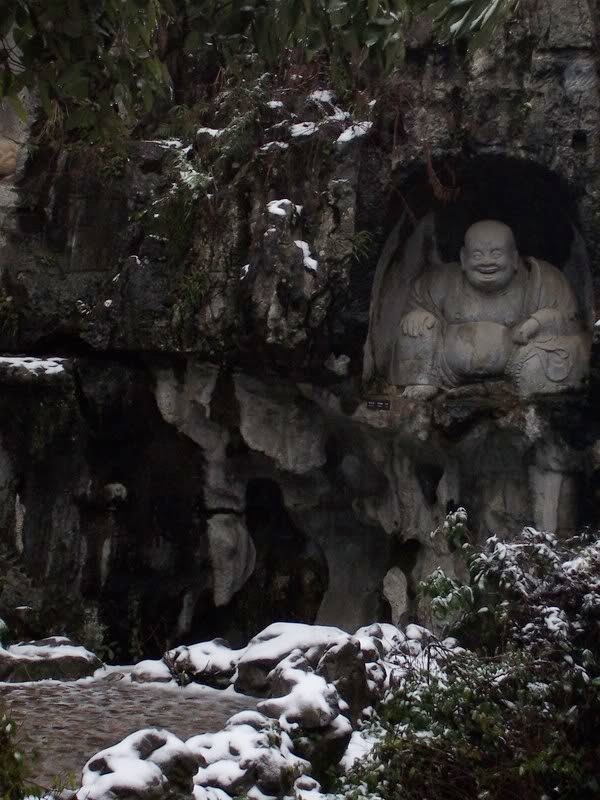 A laughing Buddha statue at the Feilang Feng grottoes at Lingyin temple. 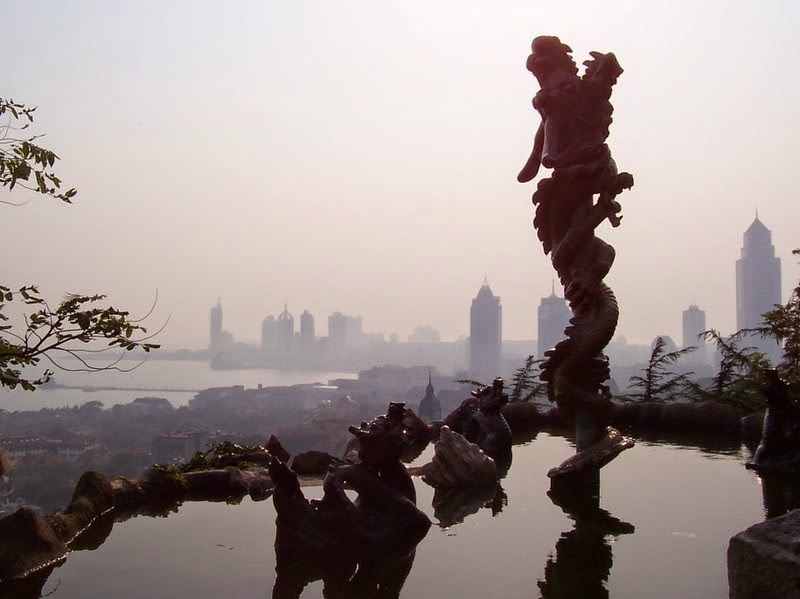 According to legend, the mountain into which the carvings were made flew from India to Hangzhou as demonstration of the power of Buddhist teachings. Most of it was created in the 10th century when the Lingyin monastery was at its peak. The monastery was originally founded in 328 and has been rebuilt many times. The current buildings are modern restorations of late Qing buildings. The temple includes an 800-year old Buddha statue as well as the largest wooden Buddha statue in China. 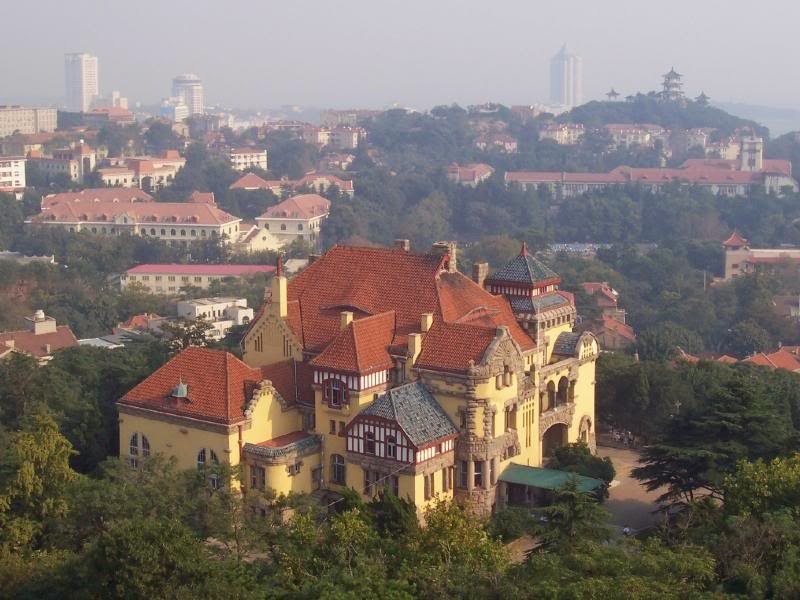 The governor's mansion was built in 1905-07 as the official residence of the German governor-general of Jiao'ao, referring to Jiaozhou bay. The area became German territory on a 99-year lease in 1898 though the Germans had shown interest in the area since 1860. It was taken over by the Japanese after WWI. The governor was reportedly fired due to the high cost of his mansion. St Micheal's Cathedral was built by a German catholic missionary society called Divine Word Missionaries, which had been present in Shandong since 1882. 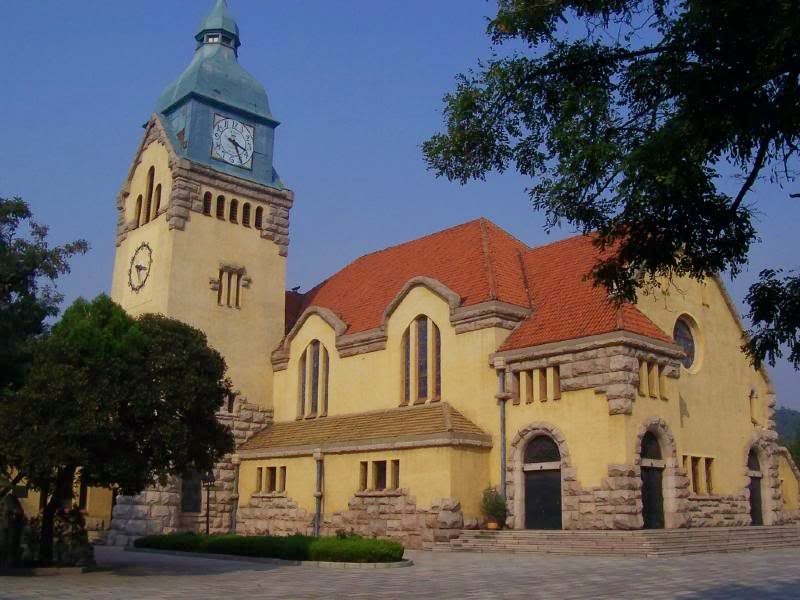 A mission hall and chapel was completed in 1902 and there were originally plans for a gothic style church but this was disrupted by the German surrender of Qingdao in 1914. The project was picked up again in 1928 and building was completed in 1934. 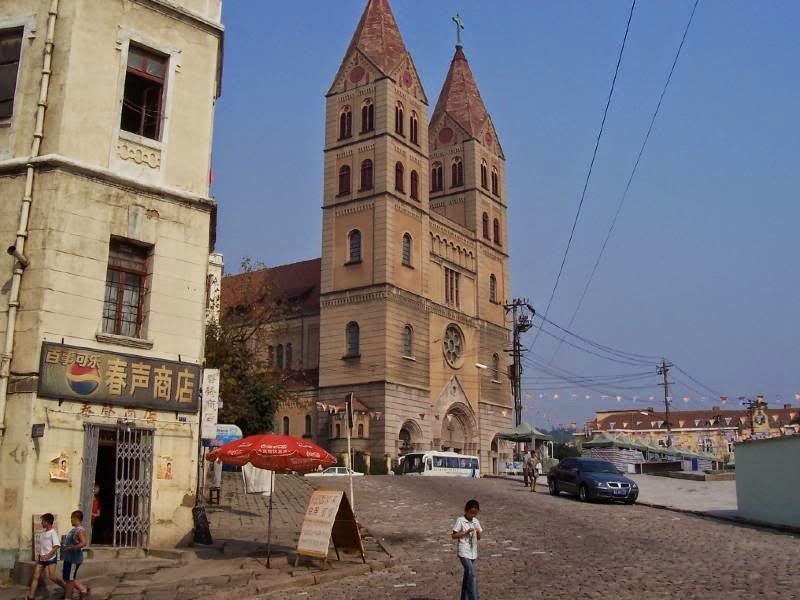 The Qingdao Protestant church was built in 1908-1910 to a design by architect Curt Rothkegel as Qingdao's parish church. It has previously been called the International church or the Qingdao Gospel Church. 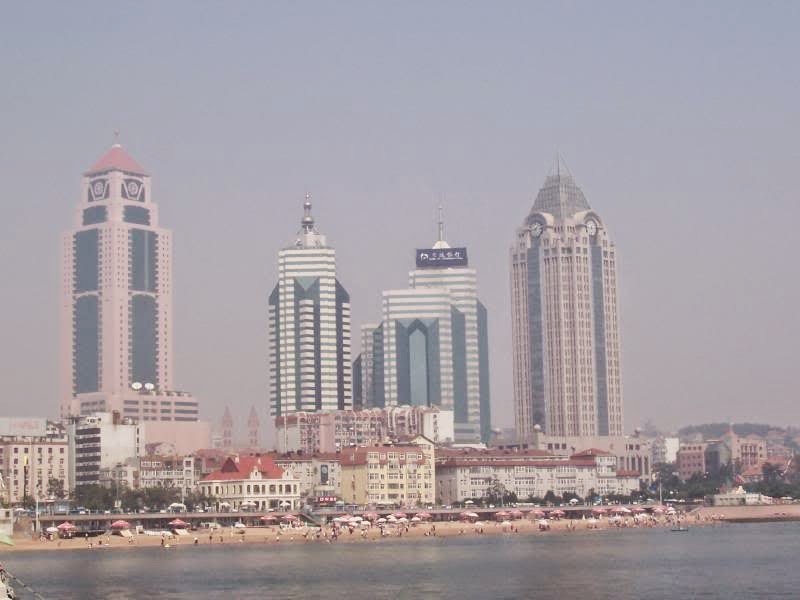 Construction of the 140-metre Qingdao Custom House began in 1992, according to information by skyscraperpage. The little building on the right is a restaurant. 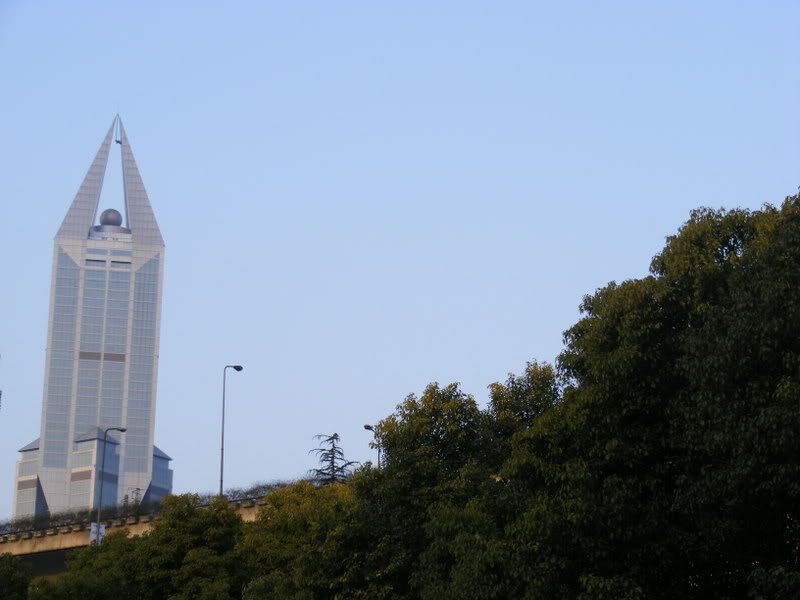 There are few tall buildings in the oldest part of Qingdao, mostly situated around Zhongshan road. This includes the 213-metre Parkson plaza completed in 1998 (left). The other buildings appear to be a complex of bank buildings and a government building. Signal Hill in one of the 10 major hill parks in Qingdao and is named after a signalling station from the German colonial period. An observation pavilion offers 360 degree views of the city. Tai Shan is the eastern of the of the sacred mountains recognised in Chinese culture as the five great mountains, destinations of pilgrimage and ritual sites of imperial worship. The mountains are mostly associated with Taoism and Buddhism, while two other separate groups of mountains are known as the four sacred mountains of buddhism and the four sacred mountains of taoism. Tai Shan has been a place of worship for at least 3000 years. The tallest peak is the Jade Emperor Peak. The largest temple complex in the area is located at the foot of the mountain in the city of Tai'an. The complex is built on the pattern of an imperial palace and is only one of three such remaining in China, the other being the Forbidden City in Beijing and the Confucius temple in Qufu. Another temple complex, near the top of the mountain, is the Azure Clouds Temple. The Hanging temple of Xuankongsi was originally built over 1500 years ago. According to legend, the structure was built by one single monk. Successive repairs and extensions have resulted in the temple as it stands today. 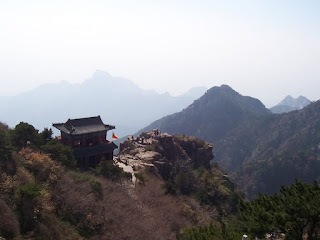 It is built on a cliff face 75 metres above the bottom of a canyon basin and is located near Heng Shan, one of the five sacred mountains of China. It is the only remaining temple to unite the three religions of Buddhism, Taoism and Confucianism. The HSBC building on the Bund was built in 1921-23 to a design by architects Palmer & Turner. It was the Shanghai headquarters of HSBC until 1955. The bank was first established in Shanghai in 1865 and moved to the former Foreign Club in 1874. The bank purchased some of the neighboring properties in 1912 before redevelopment began around 10 year later. 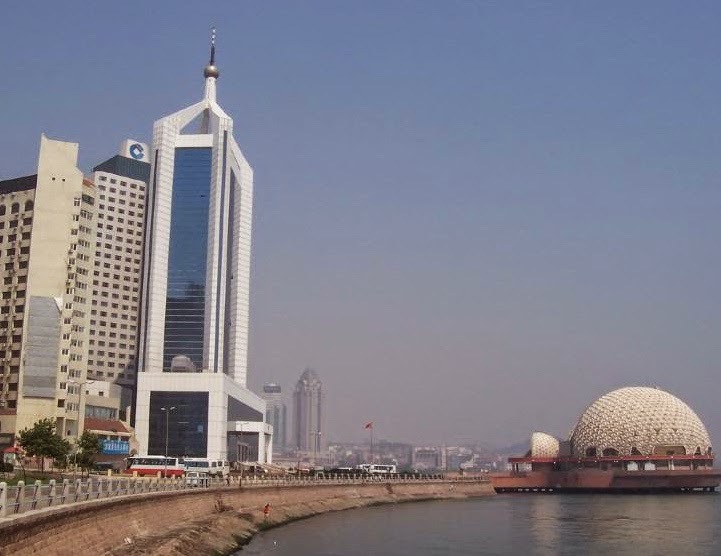 Palmer & Turner also designed the Yokohama Specie Building, the Yangtze Insurance Building and Bank of China Building, which are also all on the Bund. The tower on the left was completed in 2002 to a design by John Portman and Associates. Its distinctive crown is in a shape of a lotus flower. Tomorrow Square was built in 1997-2004 to a design by John Portman and Associates. The architectural firm was one of the first American companies to establish a China office in Hong Kong in 1979. A Shanghai branch was set up in 1993, by which time the Shanghai Centre had been completed in 1986-1990. At 165 metres, the central of the complex was the tallest in Shanghai at completion. Tomorrow Square reaches 285 metres and twists 45 degrees from the 37th floor to mark a change of function from flats to hotel. The lower section was originally intended for office space. The Jin Mao Tower (420.5m) was the tallest building in China from 1999 to 2008, when it was surpassed by the nearby Shanghai World Financial Tower (492m). The latter held the title until the Shanghai Tower was completed in 2015, and taller skyscrapers have since been completed in Shenzhen, Guangzhou and Tianjin. Jin Mao was designed by Skidmore, Owings and Merrill; while the Shanghai World Financial Centre is by Kohn Pedersen Fox.